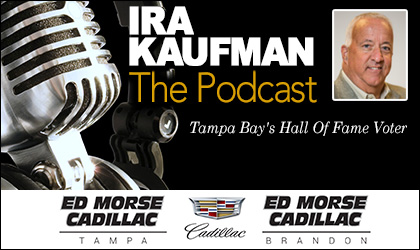 More in depth chatter on the state of the Buccaneers from The Sage of Tampa Bay Sports on The Ira Kaufman Podcast. All kinds of wisdom is flowing. All the fun is presented by Ed Morse Cadillac Tampa and Ed Morse Cadillac Brandon. Check out their Tournament of Savings event now while you listen! Run game!!! Thanks sage. Fix the OL. Fix the run game. Helps Jameis. Helps the Win Column. For a guy who spends 24 hours a day 7 days a week pumping out material on the Bucs , how is it possible for you not to have any insight in what the PLAN is? You are obviously a talented business man for putting this sight together. However your personal opinions on the Bucs are weak at best. You cannot get past your pride. Whaaat? C’mon, man. This organization has been so dysfunctional in its planning that you can’t even assume there is a hard plan — at least one that compares to that of good organizations. Maybe some clarity comes as the draft happens and more moves are made, or when Licht and Arians speak soon. Never said there is no insight, just that the insight isn’t adding up to a firm grasp of what they’re doing. 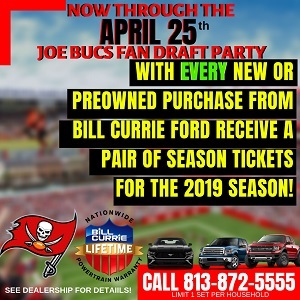 Whatever the plan is, it certainly isn’t jibing with a team that thinks it’s ready for a Super Bowl run in 2020.–Joe The facts are on the table. It is not that hard to have an OPINION on where they are going. They have a roster which includes 14 players they have drafted in Rounds 1, 2, or 3 in the last 5 years (9 of which came in the last 2 years). They have also added 4 more in that category drafted by other teams. You add in at least 3 more this year and you have a roster with 22 players with 5 or less years of experience. Might they believe it is time to provide these players opportunities. Might they have sought out a coaching staff with a reputation for development of young talent. Might chasing Starters in free agency have blocked those opportunities. Might adding depth in free agency provide badly needed insurance for those cases where they youth just does not cut it. Might they want to see what they actually have on the field in OTAs before making any more big moves. Might there still be few roster cuts and free agent adds as a result of what they see. Might the previous coaching staff have sucked. Might emphasizing pressure and blitzing effect the opposing QBs. Might playing your corners up rather than off 10 yards yield a different look. Might one year contracts let you find out who are the keepers. The worst thing that happens is you loose somebody to free agency. Might their be compensatory picks as a result. What the hell is the plan? I have absolutely NO IDEA. Is it a good plan? Maybe, maybe not. But is impossible to imagine what the plan might be? Hey, phatty. It’s site. Website. Sight is something that happens behind your eyeballs. WELCOME one and all to NegativeBucsfan.com!!!!!!!!!!!!!!!! Thanks BCPS. You are right. I noticed that mistake along with at least one other after I posted. I hate mistakes. They shine so bright, they become all I can see. Hope to do better in the future.